How to get high-speed data in the USA or International broadband Internet while traveling? Skyroam! Using the Internet while on the road can be a headache for travelers, especially those of us who need to work remote while traveling. Our last BIG family vacation was to New Mexico from our home State of Wisconsin and finding the best option for high-speed Internet was a daunting task which I needed a solution for working while traveling from State to State. 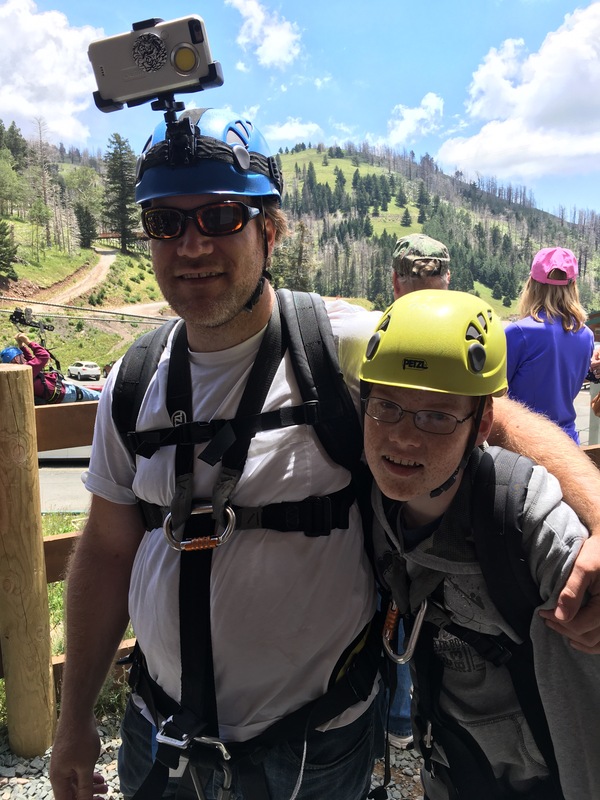 As we planned our family vacation from Wisconsin to New Mexico (insert screams of excitement from atop the SKI APACHE ZIP LINE!) a GREAT solution I discovered for how to get broadband, high-speed data for work, while we were physically driving or in a remote location with no wifi connection was Skyroam? Some of the links in the post are affiliate links which means if you click through and make a purchase, at no additional cost to you, I may receive a commission which helps me with things like paying for shipping on giveaway items, to keep the lights on, pay my WordPress.com hosting fees, feed my children LOL. Before stumbling upon Skyroam, I first looked at my mobile provider/carrier, US Cellular prepaid service (similar to post-paid plan but no paper bill in the mail each month) which turns out, when I roam with my current plan, data is capped for my monthly billing cycle at 450 megs of 4G LTE data and then they throttle down speeds to 2G, ugh. This would not work as I needed a solution which had more daily bandwidth!! I am so thankful for Skyroam and it provided my whole family with high-speed Internet in the truck while traveling or while at the hotel with slow Internet! This excellent service provides up to 500 megs of 4G LTE data daily for as low as $8 per day and you have the choice of renting the Skyroam hotspot device or you purchase the device outright. All you have to do is sign up is visit the Skyroam.com website and enter your travel details and they ship the device directly to you in time for your travel trip. Connect with Skyroam’s socials at: Instagram | Twitter | Pinterest or visit the Skyroam for more info! For 2017, my New Year’s resolution is to explore and travel to more destinations than I did in ’16. I’ve loaded my Instagram account @matt.w.sweeny by following the list below of best travel Instagram accounts for 2017, it’s time to get out and explore! Below are groups of Instagram accounts which I foresee as having the best insights on travel in 2017. For the record, some images below show “Follow” but we have followed all of these with our Instagram account @matt.w.sweeny. Last week, OurFarmilyReviews.com Contributor Marilyn (Grandma, as my kids refer to her) set her sights, with her friend, on a two-week long sightseeing trek around the Southwest (USA). I’m pleased to present this update from her including excerpts from her friend Susan, which comes to you as she’s on the road traveling via train from Chicago to NM to pickup a car rental with select accommodations as they enjoy traveling USA’s Southwest. We kicked off the trip leaving the Chicago area and traveling the first leg via Amtrak’s Southwest Chief. I haven’t taken a train trip in 20 years and it’s hard to believe that I’ll arrive in New Mexico tomorrow morning. If we were driving it would take 2 1/2 days. Wow! And, round trip, it was only $200. Much cheaper than paying for motels, food, and gas. This weekend, we’re taking a short haul south to visit Grandma. I love the idea of preparing some screen time for the kids to enjoy on the road which, it’s a blessing to have quiet time too. There will be no Netflix in our car so the best option for the kids is DVD’s from the local library – I’ll be stocking up on kid friendly movie titles which will be appropriate for all three of my boys 4, 7 and 12 years old. Here’s what I’ll be looking for this evening at our local library to bring with us as we travel for a fun weekend at Gramas’. Image courtesy of Hoover Library.